It was so nice out this weekend here in Utah. I love this weather, and in my head it already feels like summer..but really its only March, so summer needs to hurry up. I wanted to start this post off by saying so thanks so much for all the sweet words and support I have gotten from y'all regarding last week's post and all the changes I'm going through! It really makes me feel so much better, so thank you!! Well this outfit to me feels really preppy. I don't usually dress on the preppy side, my sisters joke that my style is so different then theirs because they are super preppy...Well I think my two sisters would actually wear this outfit. I found this striped dress at Old Navy, I love that store, they always have the cutest things, well I thought this dress was so chic and adorable. Its perfect for this Spring and Summer coming up. 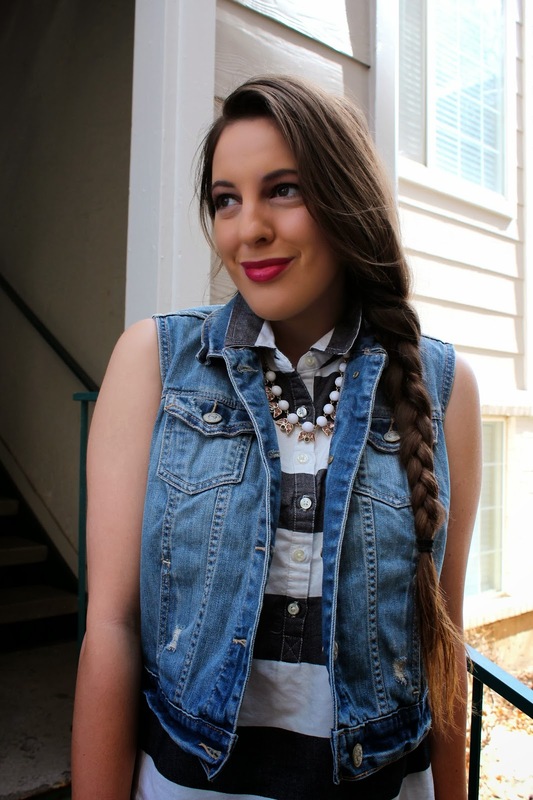 I paired it with this favorite piece of mine lately, this denim vest from Aeropostale. I can not stop wearing it, it adds so much to an outfit. I'm seriously all for denim, and adding it anyway you can to an ensemble. I added my white converse to this outfit, and it was probably my favorite thing. Any outfit that you can wear these babies is a good one! So overall I thought it was a good preppy outfit that suited my style. How do y'all feel about preppy outfits? I love it! The dress is so simple until you add the denim. I wear my chucks with my dresses too, haha. 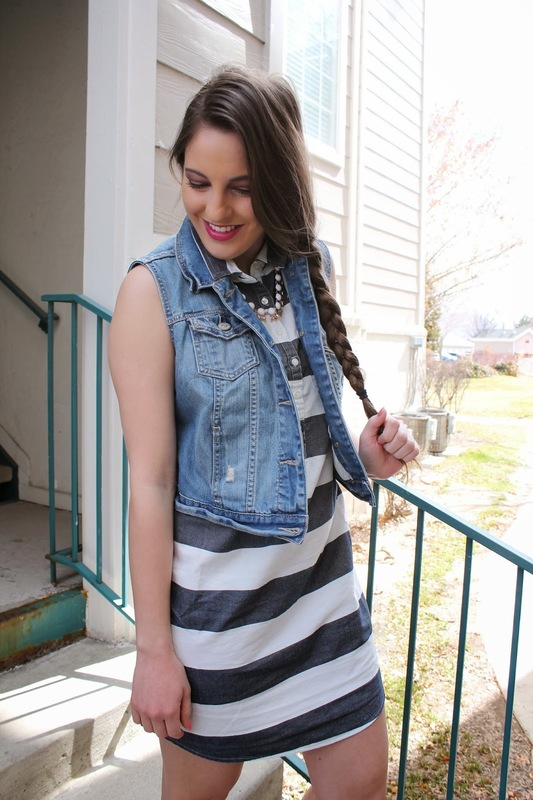 Love that Old Navy dress; I saw it instore and now I seriously regret not purchasing it! I'll have to go back and see if it's still available! Perfect addition to any spring wardrobe. loving this look! it's preppy, but still really fun. 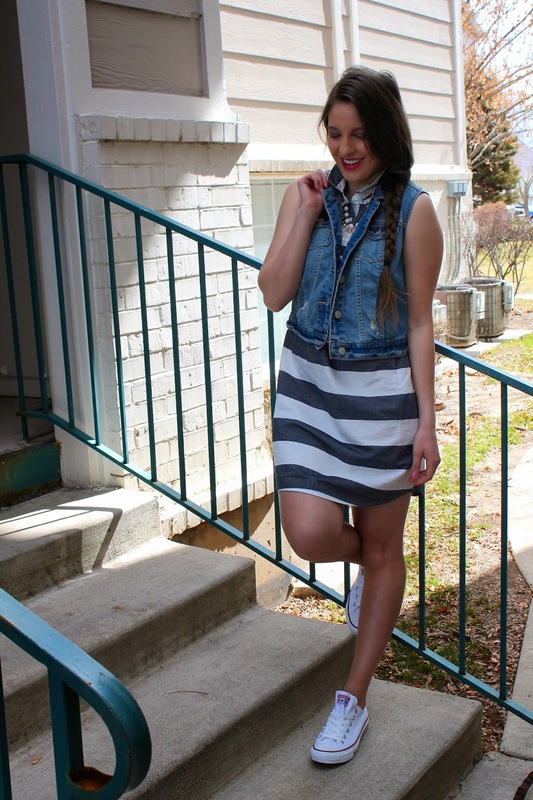 that dress is adorable and it pairs perfectly with the cons and denim vest. So fun! This is the perfect spring outfit! 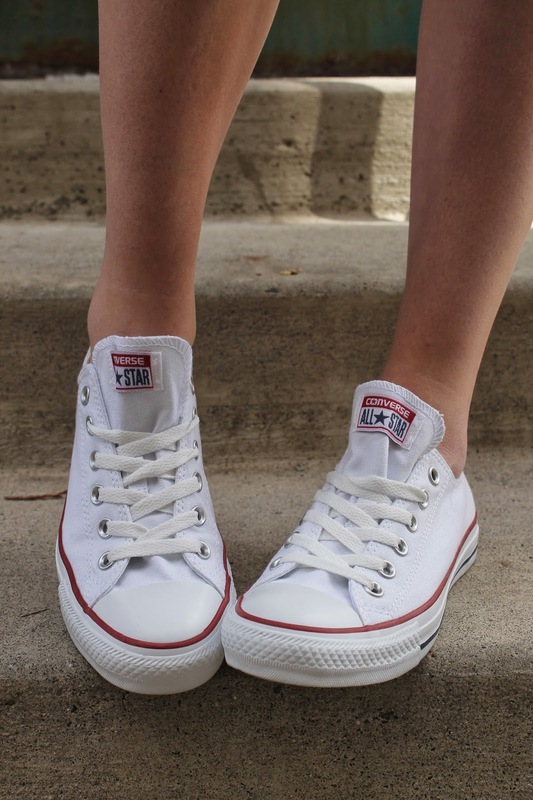 Makes me excited to pull my converse out! Really cute style girl! I love denim vests and converse are a classic! Great to find another lds blogger! I love that dress, and your hair looks adorable! It must be so much fun to have sisters, I was doomed with 3 older brothers! Your hair looks so adorable! !